Manchester City midfielder Fernandinho admitted that there were ‘strong words’ shared at the interval by players and staff after a horror show against Lyon. Pep Guardiola was forced to watch on from the stands as he began serving a touchline ban, helpless as his team succumbed to a disappointing 2-1 defeat against the French outfit in the Champions League on Wednesday. Maxwell Cornet and Nabil Fekir found the back of the net for the visitors before half-time, to go in with a two-goal advantage at the break, much to the dismay of expectant City supporters at the Etihad. 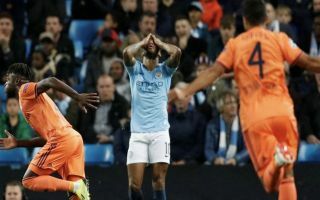 The Premier League champions did improve in the second 45 minutes and pulled a goal back through Bernardo Silva, but under the temporary stewardship of assistant manager Mikel Arteta, the Citizens were ultimately unable to rescue a point from the game. According to the Mirror, Brazilian starlet Fernandinho revealed that there was an angry mood in the dressing room after the first period, as he told reporters on Thursday: “There were strong words — not just him [Arteta], but from the players as well. That is the best way to build a very good team. “It is hard to explain [the performance against Lyon]. “I think we didn’t start well and start waiting to see what happens. When we woke up, it was so late. We concede two goals and in that competition, we cannot win like this. We pay for that. We hope next time it won’t happen. Guardiola must now galvanise his squad for a trip to Wales to face Cardiff City on Saturday, as they continue their domestic campaign looking for an immediate return to winning ways. City have picked up 13 points out of a possible 15 so far this season in the league and supporters will be expecting the team to rediscover their best form as quickly as possible, in their bid to defend the title they won at a canter last term.